Two-time NCAA Championship coach Billy Donovan has put together a challenging player development workout that is designed to build the core fundamentals of the game of basketball, while building the relationship between you and your son or daughter. As a player, "Billy the Kid" led the Providence Friars to the NCAA Final Four under then head coach Rick Pitino. In this DVD, Coach Donovan puts his 15-year old son through a comprehensive workout to develop great ball handling skills, shooting skills, and defensive fundamentals. Donovan breaks down every skill in a straight forward manner so that any parent can participate in the workout with their child. Donovan demonstrates how the workout drills can be used at game speed in order to increase their effectiveness and provide conditioning benefits. During the drills, he gives coaching points to help you identify mistakes within your child's skill development. Donovan demonstrates basic two-ball dribbling drills that will help improve your player's weak hand. He adds in a layup from both sides of the basket and incorporates various moves to improve their open court ball handling skills. By using cones and chairs to represent defenders, Donovan demonstrates how each move should be executed. He also helps you identify and correct mistakes while watching your child execute the moves. Discover a great shooting workout that builds the proper fundamentals needed to become an effective shooter. Form is more important than range. 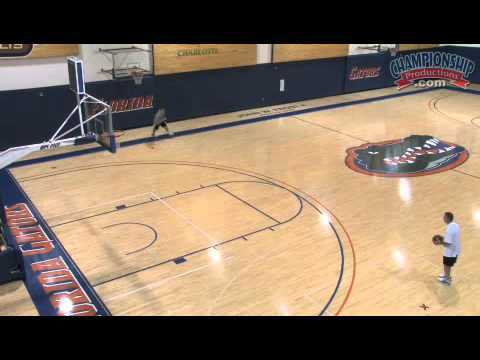 Develop good habits as you move further from the basket to increase your shooting range. Donovan will take you through the fundamental signs that your son/daughter is not in their proper range: Moving their head, getting their whole body to turn for momentum, and bringing the ball from the side of body. After explaining and demonstrating proper shooting form, Donovan has his son demonstrate several shooting drills to train good form and build confidence. In addition, the shooting drills help train pivoting skills in both the post and on the perimeter. These drills teach your son/daughter to pivot off of both feet and to be fundamentally sound by finishing with either hand. Learn the proper stance your son/daughter will need to be successful on the defensive end of the court. Regardless of the defensive system they play in - the stance and slides will be the same. Donovan teaches you how to properly move in a defensive stance and how to incorporate pivoting into your son/daughter's defensive routine. You will learn the step and slide routine that will help your son/daughter shut down their opponent. As a bonus, Coach Donovan includes a printable 27-page pdf on the DVD that contains drills and philosophy to build a better basketball player. If you are a parent looking for a DVD to help your son/daughter develop their basketball skills don't look any farther than here. Coach Donovan and his son will give you material that will help you through several years of playing youth basketball.